This is a most interesting surname of Indian descent but comprising elements of Afganhistan and Turkish origins. 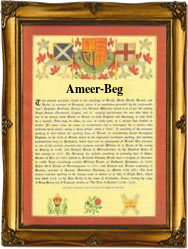 "Ameer" is the early Afgan word for High Ruler or tribal Chief, and similar to the more usual "Khan". "Beg" is the medieval turkish for a noble or senior official, although in modern Turkey it is held to be equivalent to the European formal address of "Monsieur or Herr". Such name recordings in the Romanic alphabet are not found in India before the Victorian period and only rarely then. In this case the first name holder was born in England (below) at Mulgrave Castle, Whitlby, Yorkshire, where his father was on the staff of the Mharajam Dhuleep singh, then in residence. It would appear that the name holders spent time in Egypt before returning to England where at Chesterton (Cambridge) a son was born on June 7th 1890. The "Ameer of Afgahistan" was the former ruler of the Kyher region, and it is believed that the present name holders have this descent. The first recorded spelling of the family name is shown to be that of Wirzia Accram Dhuleep Amee-Beg, which was dated February 4th 1863, born at Mulgrave Castle (seat of the Marguis of Normandy), during the reign of Queen Victoria "The Great White Queen", 1837 - 1901. Surnames became necessary when governments introduced personal taxation. In England this was known as Poll Tax. Throughout the centuries, surnames in every country have continued to "develop" often leading to astonishing variants of the original spelling.